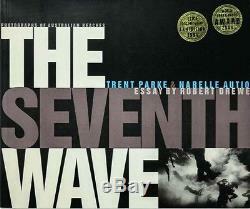 The Seventh Wave by Australian photographer Trent Parke and his wife/fellow photographer Narelle Autio. It is a collection of surreal photography taken beneath the waves, and amongst diving, jumping, and paddling swimmers. This is a very hard to find monograph in pictorial wrappers and even harder to find signed by both photographers. This copy is in as new condition, spine is perfect with no creases and it has 2 small award stamps on the front cover. One for the Leica documentary exhibition 1999 and the other the world press photo award 2000. Trent Parke, the first Australian to become a Full Member of the renowned photographers' cooperative Magnum Photo Agency, is considered one of the most innovative and challenging young photographers of his generation. The item "Trent Parke & Narelle Autio The Seventh Wave Double Signed 1st Edition SCARCE" is in sale since Sunday, July 20, 2014. This item is in the category "Books, Magazines\Non-Fiction Books". The seller is "tomthumbbooksandprints" and is located in Bowral, New South Wales. This item can be shipped worldwide.